Which Garden Mulch is Best to Use? 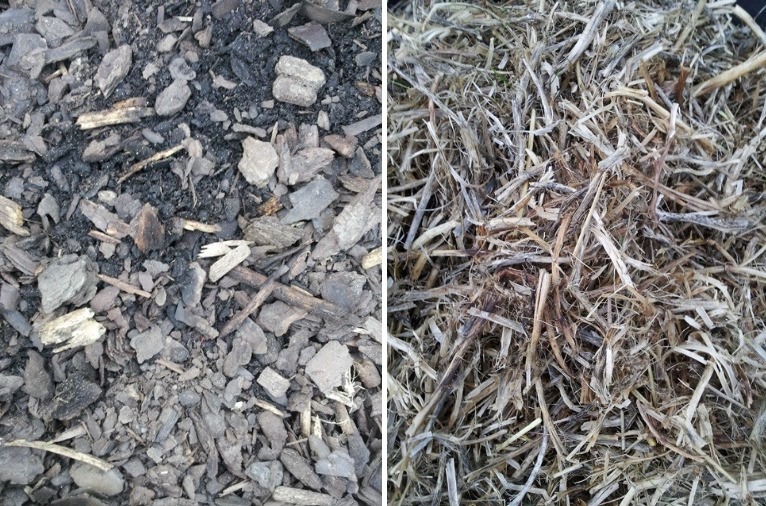 Hard woody mulches or soft non-woody straw-like mulches, what’s the difference? They both work equally well as garden mulches to moderate soil temperature, reduce water loss from the soil through evaporation, conserve soil moisture to reduce the need for watering, inhibit weed seed germination and suppress the growth of weeds. Selecting the right kind of mulch is important, as it can make a huge difference to the quality of your soil over time! Typically, woody mulches take longer to break down, usually around two years, as compared to six to twelve months for the soft non-woody mulches. But there’s more to consider than longevity, namely what happens when the mulches do break down, the ecological process of soil building and the carbon cycle. Nature recycles everything! We’re all familiar with the water cycle, where rain falling from the sky soaks into the soil, the water is taken up by plants and transpired through their leaves back into the air as water vapour, which forms clouds and repeats the process. Well, there are cycles for all soil nutrients too, including carbon. Mulches are carbon-rich materials, so when they break down, they release carbon back into the soil. If there’s a carbon cycle, that would logically suggest that the carbon can move, and may possibly not stay in the soil. 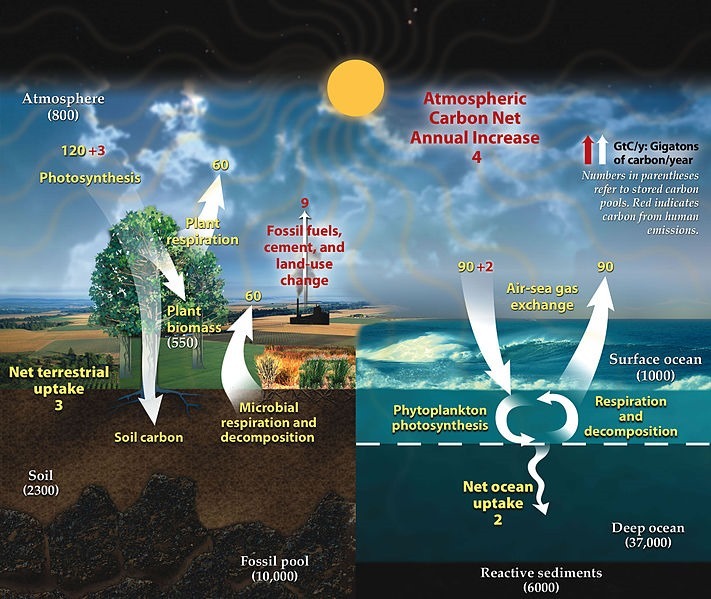 When we look at the carbon cycle, we can see that carbon does indeed leave the soil naturally through microbial respiration and decomposition (as carbon dioxide), or through made made changes to the environment. That said, soil carbon is not all the same, and depending on the form of carbon we’re talking about, it may leave the soil very easily or it may be extremely stable and stay in the soil for a very long time. Organic materials are essentially materials which contain carbon, the building block of all life on this planet. All living things are carbon-based life forms, us included! Soil is one of the most complex ecosystems on the planet, extremely rich and diverse in life, so it’s no coincidence that it contain a very wide range of organic materials, each with diﬀerent chemical and physical properties. Soil organic carbon in its various forms is generally divided into two major categories, labile carbon which decomposes relatively rapidly (days to years) and stable carbon which takes much longer to decompose (many years to decades to centuries). There is a further category of stable carbon, such as biochar, referred to as recalcitrant carbon which can last much longer, and may persist in soil for centuries to millennia. Labile soil carbon is composed of small pieces of plant material 0.05–2 mm in size, as well as living organisms and the remains of dead organisms, all of which can break down relatively easily, serving as an energy source for soil organisms, and therefore able to be recycled through the carbon cycle. Stable soil carbon is composed of much finer particles of organic matter that are either physically protected within clay for example, or are in a chemically-stable persistent form such as soil humus. In case you’re wondering, humus is ‘the black stuff in soil’, it’s essentially decayed organic matter which is very finely broken down and resistant to further breakdown, and it plays a very important role in the retention of moisture and nutrients in the soil. When organic materials break down and decompose, what is basically happening is that soil microorganisms are breaking them down to use them as food, as an energy source. Since labile soil carbon materials break down more easily than stable ones, soils with more labile organic carbon will have a larger population of soil microorganisms feeding on them, and they will release more nutrients as a result of the decomposition process. Now that we’ve made that distinction, it’s important to discuss which mulch materials create labile soil carbon, and which ones create stable soil carbon and a nice, dark, rich, long lasting humus. All woody plant materials contain lignins, complex organic (carbon-containing) compounds which play an important role in providing structural support of plant cell walls, particularly in wood and bark. Chemically, lignins are cross-linked phenolic polymers – polymers are simply large molecules made up of smaller molecules repeatedly chained together. Plastics are synthetic polymers, and as an example, polystyrene is made up of many (Greek poly-, "many") styrene molecules linked together. A cross-link is a chemical bond that links one polymer chain to another, creating a stronger structure. Due to their chemical structure, lignins are rigid, and very resistant to decomposition and breakdown. Bark contains more lignins than wood, and that would make sense as you would want the outside of a living tree to be resistant to decay! Therefore, mulches made of tree bark are higher in lignins than mulches made of tree wood alone, but both, when completely broken down into fine composted matter, create a dark, rich humus that is high in lignins, and therefore high in stable soil organic carbon. Soil Carbon – Slow in, Slow Out, or Fast In Fast Out? Woody mulches break down quite slowly, eventually releasing their lignin-rich humus, which is a stable soil carbon, into the soil. Since bacteria cannot readily break down stable organic soil carbon, it can last in the soil for years, decades or centuries. Over time, the soil will become darker and richer, improving soil quality. 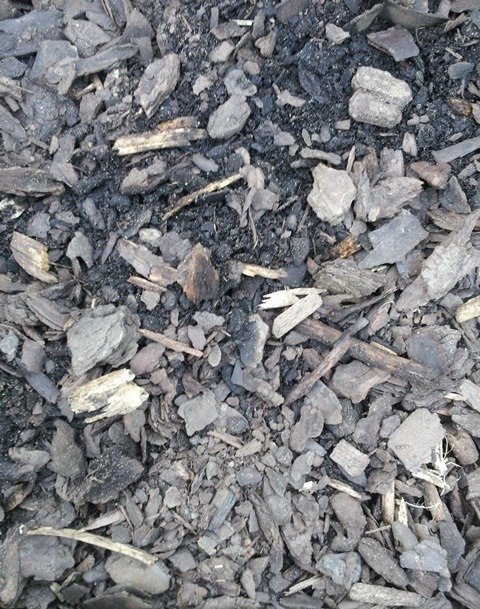 Woody mulches create a stable soil organic carbon – slow in, very slow out. Gardeners who use non-woody mulches in their gardens during the start of the warm season usually notice that by wintertime the mulch will have all broken down back into the soil, depending on seasonal humidity levels. Non-woody mulches include all the soft mulches, such as straw, lucerne, sugar-cane, and pea-straw, as well as any non-woody plant material that you may chop-and-drop on the soil surface. Non-woody plant material which is composted or buried in the soil acts in the same way, it breaks down very quickly, adding carbon the to soil very fast, because these are labile soil carbon materials. Microorganisms are able to feed on labile soil carbon materials, and If we look at the the carbon cycle, just like us, they can engage in aerobic respiration, using oxygen and organic matter to produce energy, releasing the waste products water and carbon dioxide, the latter of which returns as a gas to the atmosphere, where it can be taken up by plants during photosynthesis. Non-woody mulches create a labile soil organic carbon – fast in, fairly fast out. Non woody mulches break down faster and more easily, adding to the pool of labile organic soil carbon, which is available to bacteria. The carbon enters the soil quickly, and leaves just as easily – Fast in, fast, out. Woody mulches contain lignins, these compounds are complex organic polymers which provide structural support in the cells of woody plants and trees, and are resistant to breakdown and decomposition. Once woody plant material breaks down into the soil, the lignins remain, strongly binding the carbon for a very longer time, forming rich, dark soil humus. It takes a while for woody material to break down, and once the stable carbon is in the soil, it will remain there for a very long time – Slow in, slow out. In Permaculture, we emulate natural ecosystems, because Nature has perfected the process of soil-boiling and plant growing! What happens in Nature? We can look, observe and learn! On forest floors we have a mixture of branches, bark and whole fallen trees supplying the stable soil organic carbon. These materials favour soil fungi and create a very stable, persistent soil humus. We also have fallen leaves, and lots of other non-woody plant materials which supply the source of labile soil organic carbon, which favours soil bacteria, and the release of nutrients which become available for plants to use. By adding both stable and labile soil organic carbon, we can enrich the soil and create a stable soil ecology which supports the growth of healthy and vigorous plant life, and that is what we should aim for. In practical terms, we can take a Permaculture solutions thinking approach and get creative, here are a few suggestions which I use in my own garden. If your garden beds use straw mulches, prune any woody shrubs and trees, chop up or mulch the woody material, lay it on the soil (and also add fertiliser and compost if you want to practise no-dig gardening), then cover with straw mulch. If your garden beds use woody mulches, before replenishing the mulch, push aside any remaining mulch and dig compost into the soil, or empty your compost bin contents on the soil surface (and also add fertiliser if you want to practise no-dig gardening), and then add new woody mulch to the top. In Permaculture, we look to Nature for inspiration, and to science for the explanations! This entry was posted in Gardening Information, What's New! and tagged garden mulches, humus, labile carbon, lignin, organic soil carbon, recalcitrant carbon, stable carbon. Bookmark the permalink. 9 Responses to Which Garden Mulch is Best to Use? One of the tree services that I worked for years ago distinguished between fresh (non composted) chips that could be used as common mulch and those that were more toxic to weeds. For example, Black walnut, bay, camphor and eucalyptus chips were broadcast in medians where no plant life was desired. Oak, pine, maple and less toxic chips were broadcast where there were toxicity would be a problem. The fresh chips would not have been healthy around young plants, but decomposed into good mulch more readily than the more toxic chips. Some plants contain allelopathic substances (chemicals which supress plant growth) which are very effective at eliminating or reducing unwanted plant growth, like the ones you mentioned. In Australia we do use eucalyptus mulch, sometimes referred to as “euky mulch”, but this is a by-product of the eucalyptus oil industry, and has had all the eucalyptus oil extracted. I find it doesn’t last as long as the other woody mulches and tends to break down after about a year. Yes, I suppose it does decompose quickly. It does not matter for sites where more gets added on top. However, one of the interchanges that the Beautification Committee wants to work on now had had so much of the toxic mulch put onto it that we must wait quite a while before we can add new plants to the site. The old eucalyptus and oaks that are already there do not seem to mind. They are near the edges where their roots are dispersed beyond the toxic zone. You’re welcome! : ) We’ll be bringing more articles that provide that level technical content in the future. Great insight thanks! You mention laying straw mulch over wood chips. I presume in very windy areas you can do it the other way round? 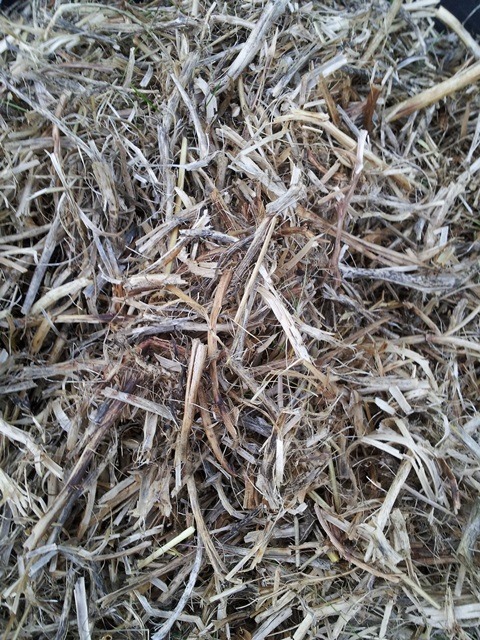 (Our straw mulch often gets blown away…) Also, interesting about the allelopathic property of Eucalyptus – I have a couple of very slow growing fruit trees, and I suspect it may because they were mulched with Eucalyptus mulch. How long do you think it takes for that effect to wear off? (it must now be about 2 – 3 years) Or should I move that mulch to areas where I want no growth and re-mulch the trees? Laying heavy woody mulch over light straw mulch is a great way to anchor it down to prevent the wind blowing it away. With eucalyptus mulch, if it’s been processed for eucalyptus oil extraction, then it’s fine to use and won’t be allelopathic. If the mulch is made simply by running eucalyptus trees through a tree mulcher, then it will definitely be allelopathic, as it will contain all the terpenes and phenols which inhibit plant growth. There are a lot of factors that will determine how long the eucalyptus mulch will be allelopathic, the simplest solution is to rake it away, and either use it to mulch around eucalypt trees, or in areas where you don’t want anything to grow.